This Seminar is an opportunity for new and experienced students to explore basic teachings and practice instructions of Zen Buddhism. No prior experience with Zen practice is required. However, all participants are encouraged to be prepared to share the questions that are most alive for them at the time. What is an open mind, an open heart-mind? Buddhism is about ending suffering and realizing freedom. Suffering, in short, is to want the world to be other than it is. 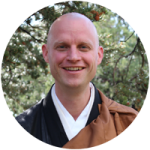 In this seminar, we will explore how our Zen practice of sitting meditation, study, and Sangha engagement can help us make space for how our lives actually are. Making space is the inner gesture from which acceptance, freedom, a kind mind, and a compassionate response can arise. Conceptually, accepting a situation and responding to it may seem like a contradiction. However, in our actual experience, they can be undivided and mutually reinforce each other. Making space for how things are means to be fully engaged in the immediate situation. The Seminar is followed by a Sangha meeting to discuss current developments in the Dharma Sangha. Please stay for the Sangha meeting if you can. Arrival 5:30 pm for a 6 pm for dinner, departure after lunch at 2 pm or around 4 pm if you stay for the Sangha meeting.